Note: Abridged reading of William Hartnell's biography. Also released as part of The Three Doctors box set. "Like the character of the Doctor, Hartnell went through several different incarnations during his career. These, together with his private life, are the subject of this carefully researched and utterly absorbing biography." From light musical comedy to a succession of mean crooks and bullying sergeant-majors, William Hartnell's long and varied career included a number of iconic British films including Carry On Sergeant, This Sporting Life and Brighton Rock. However, it is for his role as a time-travelling eccentric that he is most fondly remembered. Hartnell played the very first Doctor from 1963-1966, pitting his wits against many foes and monsters including the Daleks and the Cybermen, laying the foundations for what was to become a global institution. Jessica Carney's closely researched biography of her grandfather includes stories from many of the hundreds of stars of stage and screen with whom he worked, amongst them Richard Attenborough, Verity Lambert, Bob Monkhouse, David Langton and Lindsay Anderson. 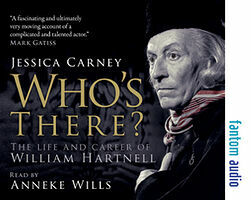 Updated and available for the first time in over fifteen years, Jessica Carney's biography is published to coincide with the 50th anniversary of the character that made him immortal — Doctor Who.